And we did feel guilty at times vacationing in a place where many people have lost so much. But we would have felt more guilty if we’d canceled our long-planned trip – since Vermont’s economy depends heavily upon tourism. And when one road was closed, we found alternatives or changed our plans slightly. No big deal. And the state was as beautiful as ever. Sooo, don’t cancel your fall foliage or winter ski trip to Vermont – and if you haven’t made such plans, consider doing so. According to the story below, Vermont is trying its hardest to be back in shape for the tourists it really needs to visit. This post was written by Burlington Free Press reporter Matt Sutkoski. BURLINGTON, Vt. — A month ago, Tropical Storm Irene tore up 500 miles of Vermont roads, battered or washed away at least four covered bridges and turned homes and businesses into muck-filled ruins in the worst flooding the state had seen in nearly a century. Now, efforts to repair highways and bridges have reopened most routes into picturesque villages where streams and rivers overran their banks. And as leaves begin to turn to brilliant fall hues, Vermont tourism officials are hoping visitors will return in the usual large numbers. In the storm-damaged Mad River Valley town of Warren, Pitcher Inn finance director Melissa Roberts says staff have been fielding questions from would-be visitors. The inn was closed after Irene because water from the Mad River invaded the building’s lower level, but the undamaged rooms reopened last week. The inn’s operators also own the Warren Store across the street, a popular tourist attraction untouched by the flooding. Most flooding from Irene affected central and southern Vermont, where such towns as Grafton, Wilmington and Woodstock, all popular with tourists, suffered serious damage. Most remaining road closures are in the southern half of the state, close to the spine of the Green Mountains, which run north-south. Through late September, just under 20 miles of state highways remained closed due to flood damage, says Chris Cole of the Vermont Agency of Transportation. Another 62 miles remained under restrictions, such as bans on commercial traffic, or under rules allowing only local residents to navigate those stretches. Eight state highway bridges remained closed, and three others were open only for limited use. Will the state’s concerted efforts to rebuild counteract the vivid images of devastation broadcast during the past four weeks? The stakes are high. 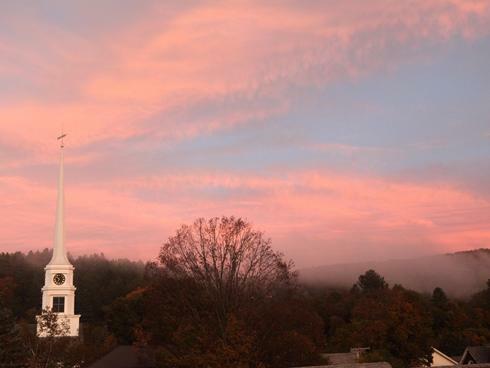 In 2009, the last year for which complete figures are available, three major draws for Vermont tourism — weddings, foliage season and ski season — generated $829 million in visitor spending, according to state tourism officials. A large portion of those weddings occur during foliage season. Cook says many parts of Vermont relatively unaffected by Irene are reporting strong bookings. But areas hit hard by the storm have few bookings, even at lodgings left undamaged, and some inns and other attractions are offering reduced rates unheard of during previous foliage seasons. Recently, the Best Western Inn and Suites in the central Vermont town of Mendon, just east of Rutland on U.S. Route 4, was offering a “Canoe & Stay” deal of two nights’ stay, full-day canoe rental and breakfast – all for $70. Some communities, such as Brandon on U.S. Route 7 north of Rutland, are getting creative. The town suffered significant damage during Irene but has bounced back rapidly. If tourists book a room in Brandon, they’ll receive $50 in “Brandon Bucks,” Cook says. Tourists can redeem the Brandon Bucks by spending them at most retailers in the town. The historicVillage of Weston, on Route 100, is offering a “Meandering in Weston Package” that includes specially priced rooms and meals at several local inns, admission to Weston’s antiques and craft shows, a gift certificate to the Vermont Country Store, lunch at The Bryant House Restaurant, and a shopping card good for 10% discounts at village shops and galleries. Meanwhile, Cook says he’s been testing the quality of the state’s repair work. One day last week, he traveled along U.S. Route 4 between Woodstock and Killington, a busy artery especially during foliage season. The highway was washed out and impassible in spots in the days after Irene. Not so this day. “The road is in really great shape,” he says. As a midwesterner – this is what I love about the east coast. Within four hours we went from rural Vermont to the beach in the Hamptons. I woke up this morning in an 19th century inn in Grafton Vermont, with a few streets lined with pristine white wood houses, a white church with a huge white steeple and red dahlias abloom, a country pond lined with field stones. Now, at sunset, I am looking out across a lush green lawn rimmed with flora and fauna, beyond it the blue still waters of Mecox Bay. Beyond that a spit of land with big homes and then the Atlantic Ocean. Just a quick post because time is limited but suffice to say that despite rain and heavily damaged roads from flooding we made it safely to both Williamstown, Mass and Grafton, Vermont. Lovely places both and much to share….later. We did come across some major flood damage today while driving north from Grafton to Ludlow and Plymouth and Woodstock along highways 100 and 4. The sun finally came out though – and what a glorious place Vermont remains! NYC seemed quiet and remarkably unscathed by Irene when I arrived on the upper west side last night. But judging from friend’s accounts and the newspapers, there is damage all around us including bad flooding in Paterson N.J. (my son left nearby Little Falls on Monday morning before the flooding began in earnest there) and power outages in Trumbull Connecticut (where we’re visiting friends on Saturday) and devastating flood damage in southern Vermont (where we still hope to go next Wednesday). I’m wondering how a pretty b&b we considered staying at in Jamaica, Vt. fared – Stone Barn Farm. One photo on the website showed a gentle creek. We ate outside on a balmy summer evening at Nice Matin on Amsterdam and 79th. Remind me not to order the nicoise salad again. Otherwise all good. Walked past the now shuttered H&H bagels on Broadway – glad to see Zabars is still kicking. (as if). Figured that’s the place to now buy bagels but apparently Fairway, also on Broadway, is too. Our ramble around the East Coast begins today and surprisingly, post-Irene we’re more uncertain about what awaits us inland than on the coast. NYC should be fine – and Williamstown, Mass. too. Vermont is the biggest issue although we’ve heard that there is now one road that leads into Grafton (but we may have to drive an hour longer to get to that road). Also not sure what the status is of the ferries we’ll be taking from New London to Orient Point and then across Shelter Island – last I checked the New London one was running but not all ferries. And last I heard, the friends and family we’re visiting in Trumbull, Ct. and Water Mill, NY didn’t have power. So we’ll need to be flexible. Getting to Grafton Vermont – this just in! 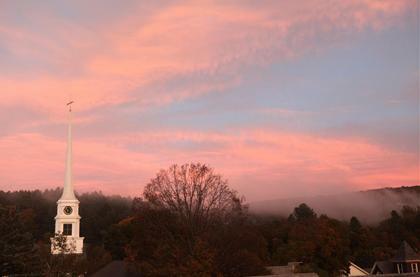 We just got encouraging word from Grafton Vt. about traveling there next week. Granted we may have to go a round-about way (since we were hoping to take Route 7 from Williamstown, Mass) but still…good to know there is a road open into town. On behalf of the entire Old Tavern at Grafton Inn family, we wanted to provide you with an update on the inn and on Grafton. First and foremost, we are OPEN for business. In fact, most every business in Grafton is open. Hurricane Irene did not damage the inn in any way, and we are very grateful for that. Grafton Ponds Outdoor Center is drying out nicely and will be open for business this weekend. Irene did hit southern Vermont hard and the village of Grafton experienced serious flooding. We have many bridges and roadways that are damaged. However, for those of you scheduled to visit us in September, fear not. Improvements are taking place daily. Regarding our sister company Grafton Cheese, we did receive some water damage in our Grafton production facility, but it is being worked on and cheese making will continue there ASAP. Our Grafton Cheese retail store in the village is OPEN. Our Brattleboro production facility and retail store are fine and operations continue there as usual. At present, getting into Grafton is through Chester, Vermont. Directions are below. We have updated our Facebook page with new photos and videos. Please visit us here. Take Exit 6 (Rockingham) off of I-91 and follow Route 103 into Chester. When you get into Chester village, take a left onto Grafton Road (next to Chester Hardware). This road will take you right into Grafton. At the end of the Road, take a right and the inn is 1/4 mile ahead of you. If you are coming in from Albany NY for the wedding this weekend, the best way to get here is to take the Mass Pike to I-91 North into Vermont. Routes 9 and 7 in Vermont are currently closed. We look forward to having you visit us in Grafton soon!